The bicycle changed American society, business and culture more than any other invention of the 19th century. 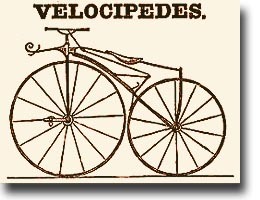 Technological improvements to a rich man's toy (Baron Draisine's walking horse) led to the introduction of the steerable velocipede in the 1860s. It earned its reputation as the "boneshaker" for obvious reasons. Note: This introductory page is under construction. As a social revolutionizer it has never had an equal. It has put the human race on wheels, and has changed many of the most ordinary processes and methods of social life. It is the great leveler, for not 'til all Americans got on bicycles was the great American principle of every man is just as good as any other man, and generally a little bit better, fully realized. All are on equal terms, all are happier than ever before, and the sufferers in pocket from this universal fraternity and good will may as well make up their minds to the new order of things for there will be no return to the old. An early advertisement illustrated Parisian Velocipedes by Wood Brothers Manufacturers. "Harper�s Weekly is really the only consistent, comprehensive, week-to-week chronological record of what happened world-wide in the last half of the nineteenth century. The 56 years of Harper�s Weekly provide a continuous record of what happened on a weekly basis from 1857 through 1912." Popular music noted the rise and fall of the bicycle and explains its popularity more entertainingly than most histories. "He flew thro' the street, with the greatest of speed . 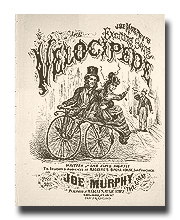 . ." begins the chorus of Joe Murphy's Exciting Song, Velocipede. Riding a boneshaker on the streets of San Francisco in 1869 -- with or without a female passenger, or brakes -- would have made for an exciting journey. Published in San Francisco by M. Gray's Music Store, the popular song was performed at Maguire's Opera House. New Yorker Pryor Dodge owns what is arguably the world's top private collection of antique bicycles and bicycle collectibles. It began 25 years ago when he acquired a high-wheeled bicycle, known as a Penny Farthing, for $600. He had the bike nickel-plated and enameled and crated to Paris where he rode it through the streets on his way to study the flute. Made of steel tubing, the bike has solid rubber tires and would have cost $125 when new in 1885. It's now worth nearly $10,000. His collection has toured many museums across the U.S. and is scheduled for East Coast showings in 2001 and 2002. Recent showings have included the UCLA Fowler Museum of Cultural History, the Oakland Museum of California and many others. 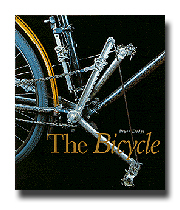 His illustrated 1996 history of The Bicycle has been widely acclaimed as a work of art and scholarship. For more about this bicycle collector and historian, read The Bike Collector by Melik Kaylan at Forbes.com.